Mosaic is a wonderfully addictive picture-forming logic puzzle. 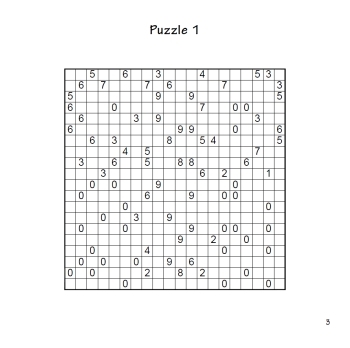 The puzzle starts with a rectangular grid that has lots of empty squares, and some containing numbers. These numbers represent how many cells are to be coloured in, which include the cell itself and all its neighbours that touch it directly, including diagonally. So in the middle of a grid, if you see the number 9, then you know you can immediately colour in the square itself and its eight neighbours. At the edge of the grid, the highest possible number is 6, and in one of the corners, the number drops to 4. If you see a 0, then you immediately know the square itself and its neighbours are blank � you might like to mark these with a dot so you remember. Once you have completely worked out which filled cells surround each numbered cell such that the number of filled cells matches the number in those given cells, the puzzle is finished, and will reveal a simple piece of black and white artwork. 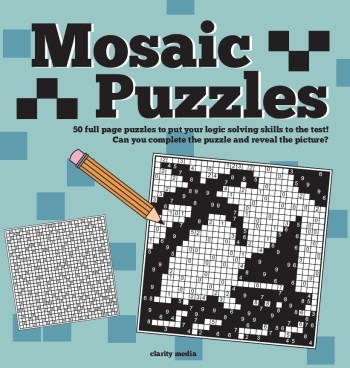 Each puzzle has one solution, and you can always find it through logic alone � you�ll never need to guess, although some logical moves can be tricky to spot and will require you to cross-reference values in nearby squares. All puzzle books are printed on very high quality paper, allowing for lots of pen and pencil marks along the way!